Martin Cox sent this photo of a postcard he has acquired. It appears to be pre WW1, judging by clothing: there is no publisher or photographer name to assist with dating. The class size was large: the back row has 12 boys, the next their teacher, a boy and 11 girls, next row a boy and 13 girls and on the front row 11 boys: althogether 25 boys and 24 girls. The children vary in size and dress; all look well wrapped up. 12 of the girls wear a white or pale pinafore and many have desses with ornamentation - frills, lace, pleats, tucks, bows - plain obviously not popular at the time. The boys wear jackets, mostly buttoned up (some fit to burst) and for the most part have white-collared shirts and long socks. The front row has been sat on mats. In the background the window glass is textured so the children could not see out and some panes have been replaced - ripples vary in direction. 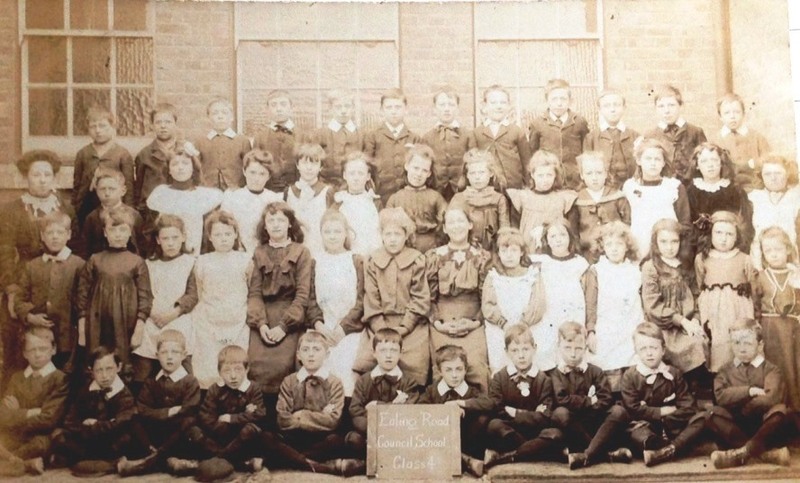 This is the earliest image on the site for the school but there ar many other local school photos for this and other schools. If anyone can help in dating this image please get in touch.